Ever since the Dutertes fielded a Daughter and Father team in the local elections in the city of Davao and won hands down, local politics were never the same again. Using the Davao filial combination as precedent, the Talagas of Lucena are pushing their luck much too far. While Davao City is an exception for being a melting pot yet the conversion of family as a political party tweaks the Constitutional ban on dynasty. Davao City is a far cry from Lucena because the latter retains for the most part the composition of its inhabitants. The pitong lahi is still very much intact in Lucena. Blood relationship heavily counts in this city. Davao City on the other hand attracts migration from the other areas of Mindanao and the Visayas. The Dutertes are not original settlers of Davao City but counts their provenance in Cebu. Understandably, because this manicured local Clint Eastwood does not stand a chance with the central Visayas old families. The Lucena political family unfortunately miserably misread the Duterte experience. Ramon Talaga in one unguarded stupor uttered, “kung tanggap nga sa Davao, bakit dito hindi?” He justified the dual run for him and his son Ramil as his candidate for Vice Mayor as his way of breaking the jinx that haunts him because for the last six elections his vice mayoralty candidate lost. For the Davaoeneos, Sara and Rody Duterte mean peaceful streets for the city. Nonetheless for some, the brash imposition of the father and daughter on the electorate was atavistic and left a bad taste in the mouth. In Lucena however, the Talagas are much brazen. The Talagas are now intoxicated with the idea that they are the best gift for Lucena. This family has been in power for the last twenty years. Nothing much has happened in Lucena except the bottom-line of the patriarch. He now counts major investments in Lucena ranging from transportation business, restaurants, gasoline stations that call the shots in price fixing, and many others. This family cornered the daily collection of linu or leftovers from the malls in the city as feeds for his bustling swine production. It is bruited about that he is richer many times over mainly due to the P5M monthly STL collections. This does not include special arrangements from annual projects funded by the IRA or internal revenue allotment. With this enviable empire, no wonder he has fielded everyone in his family as bets for local positions in the coming May, 2013 elections. One can figure out that by bankrolling the entire family in every conceivable position in the coming polls, the law of economies of scale kicks in. For every peso he deploys, it benefits ten members of the clan. Thus, he is reclaiming his old post bench warmed by his charming wife, Ruby, who has trained her eyes in the congressional contest in the second district that includes the city of Lucena. As his vice mayoral candidate, he tapped his son Ramil. One brother is running as board member in the second district as well. Another brother, Claro, is running independent in the city council. 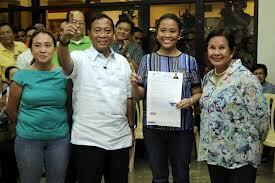 His daughter-in-law Shiely Talaga is gunning ostensibly for the vice governorship. The family members claimed alliance with every imaginable political party except the Liberal Party. Incidentally, the old man Talaga is an avid fan of the UNA chairman emeritus, Vice Pesident Jojo Binay. In his drunken moments, he boasts of a cabinet portfolio once his idol captures Malacanang in 2016, “and that’s a promise,” he emphasizes to his satisfied listeners (as his aside to Procy Alcala’s appointment as Agriculture secretary). The Talagas and the Alcalas long running rivalry in the second district’s politics is a given. Procy Alcala is not actually bent in politics. One incident in the Mayor’s Office changed his perspective. Procy is a land developer. He wanted to develop a big track of land west of the city as Industrial Estate. On his own, he made extensive technical studies on the project. He thought that the man in the mayor’s office has the magnanimity of adopting his brainchild resolved in the idea that it would be a magnet for economic development in the area. But he was mistaken. The mayor wanted a piece of the action and saliva investment. When Procy showed reluctance on the overtures of the Mayor, roadblocks upon roadblocks were put in place by the rapacious Mayor and the project went awry. The main enforcer of the Alcalas is Bang Kulit Alcala, the ailing candidate for congressman of LP to be pitted against Mrs. Talaga. Owing to his precarious health (having undergone kidney replacement) Bang Kulit was prevailed upon to run in a smaller area. Bang Kulit is unbeatable had he run for governorship. For the last three years he has organized and maintained a formidable provincial machine manned by decent local leaders. It is doubtful if his organization can shift its oars in the direction of another governor wannabe. In 2010, the Talaga family was nursing its wounds. They were put one over by Procy who was then a reelectionist congressman well into his third term. No doubt of course that Procy was unbeatable at that time. But Procy had many things in his mind (not to mention his tiff with the late Raffy Nantes). Noynoy Aquino was running for the Presidency and Procy set his eyes on the DA post having cut his teeth in the Agriculture Committee in Congress plus his successful Pamilihang Bayan (with Ariel Manalac at the helm) which he wanted replicated nationwide. Because he kept his card too close to his chest, he made it known ostensibly that he is running for reelection. With this announcement, no heavyweight from the Talagas filed for Certificates of Candidacy or CoCs for Congress at the second district as the Talaga peso would be nowhere to go. Before midnight of the filing of the Certificates of Candidacies when the office of the Comelec was near deserted, one Irvin Alcala filed his CoC under the Liberal Party. The young Alcala ran by his lonesome and won. Procy claimed his trophies: the downfall of Nantes in the hands of his new found allies the Suarezes, the DA post embellished with marching order from the President no less proclaimed in the latter’s inaugural address at the Luneta, Bang Kulit as Vice Governor, and his son Irvin as second district representative. Right after the 2010 elections, Procy basked in his glory surrounded by his factotums led by one Tony Fleta. Naisahan ang mga Talaga, ika. When the Talagas were naisahan, that was the inception of their mistrust of the Suarezes. The Mayor knew that there was an ad hoc alliance among the Suarezes, the Talagas, and the Alcalas with the sole purpose of toppling Nantes who proved to be intractable. Had Nantes won by his lonesome without the Tanadas and the Alcalas, Ador Culing would be anointed Archbishop of Alabat. The old man Talaga sensed that the patriarch of the Suarezes, Danny, knew of the plan of Procy and yet the former was kept out of the loop. Now the Talagas have known better. They are now into manipulating the election rules. The signal is obvious: we will not be outmaneuvered these elections. “Matalino din kami, ‘di ba?” With the looming deadline in bet switching on December 21, 2012, the Talagas fielded unheralded members bearing the Talaga surnames. Thus, Shiely as Vice Governor, Ruby as congresswoman, and one sibling as Board Member. Romano Talaga appears unaffected of this all. He has three posts for the picking: as Vice Governor, congressman, and his old post where he is unbeatable-Board Member of the second district. “Matalino talaga si Mayor! Akalain mong maisip yun?” one toady after a heavy meal provided by his patron was heard burping. Danny Suarez however is aghast by this Talaga spectacle. The Talaga gambit puts exclamation point on the inanity of dynasties in Quezon particularly that of the Suarezes who has one member running for governor, the sickly wife as congresswoman, and another son as Unisan vice mayor. “Magmumukha na kaming hamo-hamo,” he reportedly said. And so the Talagas with their children and grandchildren went to the elections office to file their CoCs on various positions true to their family gambit. They too just like Procy were playing their cards close to their pockets bulging with the one peso they will deploy come May 2013. “This time the Talagas would prevail,” they chorused. They vowed never to be sideswiped again by the likes of the Alcalas and the Suarezes. On their own and without any bidding from the Suarezes, the Talagas have their own game plan. “Ako ang nagpapanalo kay Jay Jay sa Lucena. Tandaan nila yan!” the old man Talaga was heard muttering. One media man opined that the Talaga stratagem is one way of upping the peso ante from the coffers of the Suarezes. In the meantime, a regular crowd of manghihingi massed in front the City Hall Annex waiting for some crumbs from the days’ remnants of the STL.